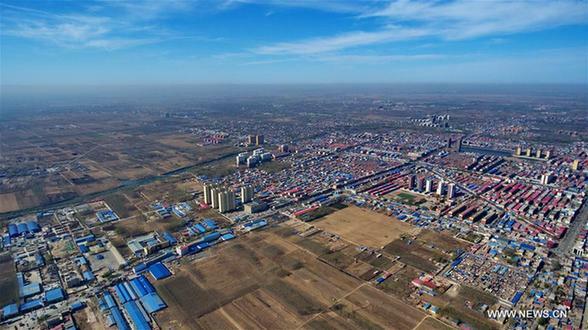 BEIJING, April 15 -- China's centrally administered state-owned enterprises (SOEs) have voiced support for Xiongan New Area in Hebei province, pledging efforts to participate in its construction. Telecom giants China Unicom, China Mobile and China Telecom said they would offer advanced communication services to the area, supported by innovative models such as cloud computing, big data and e-commerce. China Mobile and China Telecom will make sure Xiongan is covered by a 5G network. Wang Yupu, chairman of oil giant Sinopec, said the company will increase investment into geothermal energy in Hebei, and China National Petroleum Corp. (CNPC) plans to focus on natural gas businesses in the region. China National Offshore Oil Corp. (CNOOC) joined the chorus of support, promising a plentiful supply of clean energy to the region. Other state firms, including China Guodian Corp., and China Huaneng Group, also pledged to contribute to the construction of the new area. The plan for Xiongan New Area was officially announced on April 1. The new area will span Xiongxian, Rongcheng and Anxin counties in Hebei Province, eventually covering 2,000 square kilometers, with a population of 2 to 2.5 million. Chinese leaders hope the new area will help address the severe "urban ills" of traffic congestion and air pollution in Beijing, by curbing the capital's population growth and moving non-capital functions out of Beijing. China's top SOEs regulator on Friday announced it would establish a special working group to encourage state firms to map out future development strategies for the area. "The centrally administered SOEs have been encouraged to support the construction of the zone in areas like energy security, infrastructure, electricity, telecommunications, rail transport, ecological protection, information-based network and smart city," noted the statement from the State-owned Assets Supervision and Administration Commission.